The IP Factory supports Connecticut based entrepreneurs with new business startups in CT.
As a Connecticut based, not-for-profit corporation, The IP Factory, Inc. creates companies and jobs in Connecticut by using our closely managed commercialization process to combine proven technologies or preliminary business plans from major CT companies, a well defined analytical protocol, vetted entrepreneurs, and capital. 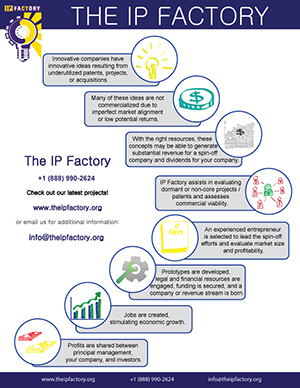 The IP Factory also works with other entities in Connecticut that support entrepreneurs and new company formation. This network includes start-up financing and venture organizations, incubators, mentor networks, entrepreneurs, and people interested in participating as part time management for startups. 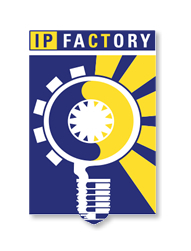 The IP Factory partners with colleges and universities in Connecticut to attract high level student teams, and faculty mentors, to work with our professionals in concept commercialization. This allows The IP Factory to integrate leading edge technology and the most innovative thinking. Utilizing PitneyBowes, RFID technology we have developed an Adult Diaper which when queried will notify health care professionals and care givers if the diaper has been soiled. Use of this diaper and notification system will eliminate the need for manual checks of the diaper. Through our research, we found there is a huge demand for a product like ours in the health care market. Discussions are underway to find a licensing partner for this product. To find out more about our latest developments with our Adult Diaper, please Click Here. The Absorbable Gastric Band patented by Covidienis another exciting project at The IP Factory. Based on an absorbable polymer this gastric band responds to many of the concerns for the traditional gastric bands in the marketplace today. We plan to form a Company in order to develop and market this product. Since this product has already undergone preliminary clinical evaluation in France, we expect to begin marketing the product in Europe while we work for FDA approval. Please Click Here to leran more about the Gastric Band.